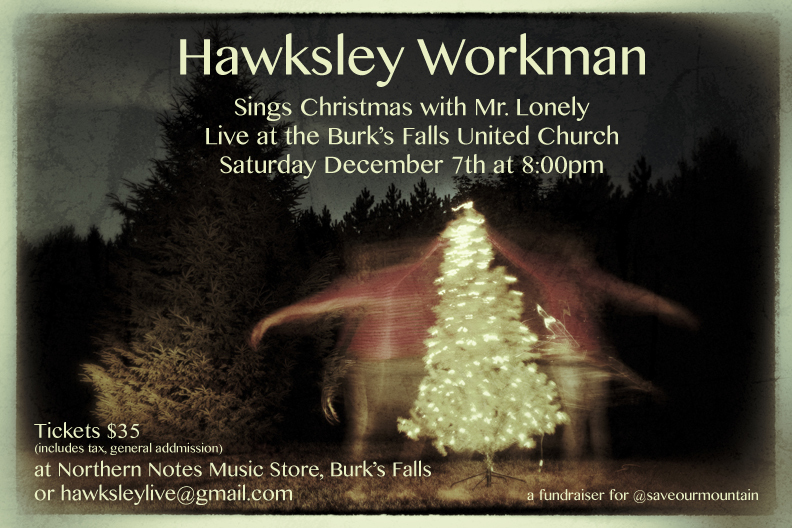 We are pleased to announce that Hawksley and Mr. Lonely are going to be performing an acoustic Christmas show at the United Church in Burk’s Falls ON on Saturday December 7th, 2013! Details below! http://hawksleyworkman.com/wp-content/uploads/2018/02/logo_menu-hawksley-menu.png 0 0 Admin http://hawksleyworkman.com/wp-content/uploads/2018/02/logo_menu-hawksley-menu.png Admin2013-10-20 16:08:152013-12-03 18:23:41Hometown Christmas Show! SOLD OUT! That God That Comes.... to New Zealand! Hawksley Workman: CBC First Play Live! Hello, I am a fellow Burk’s Falls resident and I was just wondering if Hawksley will be performing at the theatre in beautiful downtown….Burk’s Falls. Rifflandia Festival – Victoria The God That Comes… The Cultch in Vancouver!